This newly designed 4.5 by 4.4 inch PCB holds two low-voltage bipolar regulated power supplies. In fact, it holds two LV-Reg regulated power supplies. Why? Well, sometimes, you need two. But more importantly, this new PCB can be configured configured as a bipolar power supply for use with solid-state circuits. The odd fact about three-pin IC voltage regulators is that no one makes a great negative voltage regulator or, put differently, no one makes as good a negative regulator as the LD1084 is as a positive regulator. So, two positive regulators are used instead of the usual negative-positive regulator paring. How is that possible? How do you get a negative regulator out a positive one? You don’t; you make two positive regulators and stack the outputs to create a bipolar power supply by using jumpers J1 & J2. The schematic below shows how. In short, this is an audio-grade power supply. The new Dual/Bipolar LV-Reg kit is available now at the GlassWare-Yahoo store. The kit includes all the parts and a user guide and four hex standoffs and screw sets. Before beginning a tube circuit design, I like to do the back of the envelope calculations first, as they often get me surprisingly close to the final design. The alternative is to machine-gun our way to the right part values. If the circuit is simple enough, the machine-gun approach works well. For example, let's say we want to impose a first-order low-pass RC filter at 500Hz, using a 0.22µF capacitor. What is missing is the needed resistor value? 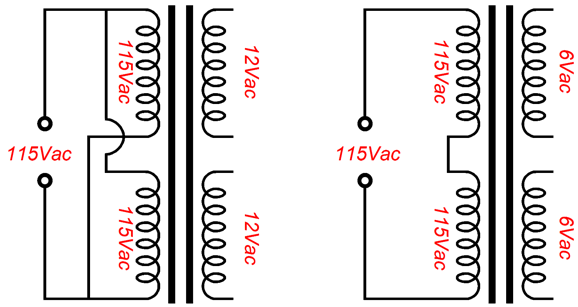 The back of the envelope approach would be to take 159155 and divide it by 500 and then again by 0.22, which yields the required resistor value of 1,447 ohms. The machine-gun approach would be to either set up a test rig with signal generator and oscilloscope or AC voltage meter; or, we might fire up our favorite SPICE program. The next step would be to try a 100-ohm resistor, then a 1k resistor, then a 2k resistor, then a 1500-ohm resistor, then a 1400-ohm resistor… eventually stopping at 1.43k. In contrast, with a complex circuit, we might find that no amount of machine-gunning will get us to our goal. Here is an example of just a handful of variables can overwhelm. Let's say you only own 8 books (a truly shameful thing, yet so very common). They are arrayed on your bookshelf, ordered alphabetically, but you decide that order is not optimal, so each day you try a different ordering. How long before you have exhausted all the possible arrangements? A week or two? A month or two? Or more? It turns out that there are 40,320 possible arrangements. As there are 365.2422 days in a year (leap years have to be included), it will take you 110.3925 years to have tried every possible ordering of eight books. 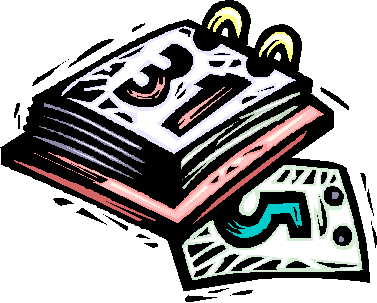 Had you owned ten books, you would need almost 10,000 years (just 65 years shy). Amazing, isn't it? Books, just books differently arranged—even if you made a new arrangement every minute, never pausing to eat, sleep, visit the restroom, you would need almost seven years to completely exhaust all the possible arrangements of ten books. Well, what are waiting for? Get to work. After being so pleasantly surprised by the LT1363 OpAmp in my last project, my mind turned to OpAmp-based hybrid circuits. My first thought was that it would be fun to design a hybrid phono stage that yielded a gain of 60dB, yet only used one tube, a 6DJ8, per channel, with passive equalization between two gain stages. Since the passive RIAA equalization network entails an insertion loss of -20dB, each gain stage would have to deliver a gain of 40dB (or 1:100), as 40dB + 40dB - 20dB = 60dB. Where mu is the amplification factor (33); Ra, plate resistor (10k); and rp, the triode's plate resistance (about 3k). plugging these values into the formula yields a gain of about 25. (I wrote "about" because most 6DJ8 fall short of the stated mu of 33.) To get to a gain of 100, requires a gain of 4 from the OpAmp, which isn't much at all. Still, since we will use two OpAmps, each delivering a gain of 4, making a total of 16, the increase in gain in dBs is +24dB, which is far more than the average step-up transformer used with moving-coil cartridges. Now, we come to the sneaky part of the design. Rather than use a grounded-cathode amplifier topology, we will use a grounded-grid amplifier topology—but with a difference. The OpAmp will drive the triode's cathode directly, but that is not the big difference. The big difference enters at the triode's grid, as it wont be directly grounded; instead, we will feed the grid a small portion of the B+ voltage noise sufficient to force a power-supply noise null at the triode's plate. Yes, we are going to make an Aikido version of the grounded-grid amplifier. Here is where we must decide which path to take: machine-gun or back of the envelope calculation. The machine-gun approach isn't too bad with SPICE. We start by placing the 10k plate resistor atop the plate and placing a constant-current source at the cathode, which we bypass with crazy-big capacitor, say 10m, which equals 10kµF. All that remains is to create a noisy B+ voltage. Now, we vary the voltage divider ratio until we attain the deepest power-supply noise null at the triode's plate. In contrast, the back of the envelope calculation begins with ascertaining what percent of the B+ voltage ripple leaks at the triode's plate and, then, dividing that amount by the gain of 25. We add the 10k plate resistor to the rp of 3k and get 13k, which we then divide into 3k and get 0.23, which divided by 25 equals 0.009. In other words, we need roughly 1/111 of the power-supply noise to appear at the grid. The easy starting values are then 110k for R1 and 1k for R2. In SPICE simulations, the optimal values turned out to be 105k and 1k. The next step is to replace the constant-current source and bypass capacitor with a cathode resistor. We know from the SPICE simulation that the cathode voltage was 3.58Vdc, and we know that the idle current was 10mA, so after we divide 3.58V by 0.01A we get 358 ohms. on the other hand, we can use a higher-valued resistor so that the OpAmp is forced to supply a portion of the idle current. Why? The steady DC current flow will force the OpAmp's output stage to run in a single-ended fashion. Moreover, we can use two resistors in series in place of one cathode resistor, as the two will also serve as the OpAmp's two negative feedback resistors. The 390 and 130 ohm resistors produce a gain of 4 (+12dB) from the OpAmp, as (390 + 130) / 130 = 4. To find out how much DC current will flow through these resistors, we divide 3.58V by 520 ohms and get 6.9mA, which means that the OpAmp must sink 3.1mA to get to the triode's 10mA of flow. The final step is to assemble the two gain stages and passive RIAA equalization network into a complete phono stage. Note that the two OpAmps run off a regulated 12Vdc power supply, with no negative power-supply rail voltage. This 12V power supply can also heat the two 6DJ8 heater elements, one 6DJ8 per channel, if they are placed in series. Also note that cartridge is loaded by a 100-ohm load resistor. This resistor can be as low or as high as needed, as the OpAmp is capacitor coupled to OpAmp. The 1M bias resistor pretty much forces us to use an OpAmp with a FET input stage, such as the OPA2107. In general, FET input stages work best with high-impedance signal sources, while transistor input stages worker better with low-impedance signal sources—at least in terms of noise and DC offsets. DC offsets are not much of a concern in this circuit, as the triodes are attached to a high-voltage power supply and are capacitor coupled at their output. What about the noise issue? My guess is that since the triodes are not in OpAmp's negative feedback loop, they will contribute far more noise than the impedance mismatch at the OpAmp's input will. Perhaps the biggest noteworthy aspect of the circuit is that the OpAmp only feeds the triode its input signal; the OpAmp does not enslave the triode within a negative feedback loop. In other words, if triode strays, it will stray. In contrast, if encompasses the triode's plate within the OpAmp's negative feedback loop, as shown below, the triode cannot stray, as the OpAmp controls its output. In terms of specs, the above circuit wins easily; but will it in terms of musicality? If we didn't want a tube flavor, why add the tubes? Okay, what about a blend of the two topologies, enslaving only the first triode within the input OpAmp's negative feedback loop, but leaving the second triode free? This arrangement would deliver a low-noise, low-output impedance output at the first triode's plate, which allow us to use a decade lower RIAA equalization resistor values, which would further reduce noise. Moreover, as the first triode ages, the OpAmp will force the triode to fall in line. The only solution is to build both versions and hold a shootout. My goal was to show how an actual circuit's design precedes. It began with the realization that modern OpAmps are robust enough to drive a 6DJ8's cathode directly and that, rather than grounding the grid, we can inject a sample of the power-supply noise into the grid and achieve a power-supply noise null at the plate as a result. Low-noise and high gain made me think of phono stages, but other applications include microphone preamps. The rest of the design followed a blend of machine-gunning our way to the required part values and working out the simple math on the back of a used envelope. SPICE proved useful, but ultimately only reality will count. In other words, some minor fiddling will certainly be needed. The closer we can get before actually building, however, the less fiddling will be needed. Where to start? Which output tube? Which OpAmp? How much B+ voltage? I say we start with the bias voltage needed for my electrostatic headphones—namely, 540Vdc. Let's make this bias voltage the B+ voltage. The next step is to chose the output triodes. By the way, it must be a triode and not a pentode, due to the triode's low plate resistance. (I built a beautiful pentode-based electrostatic headphone amplifier about 30 years ago that held horizontally mounted output tubes and Teflon PCBs, but sounded just dreadful, sounding dull, sleepy, and boring.) A twin triode tube would make life easier and we have many to choose from, such as the 6BL7, 6BX7, 6H30, 6SN7, 12AU7, 12BH7, 5687, and ECC99. I would prefer either the 6SN7 or the JJ ECC99. 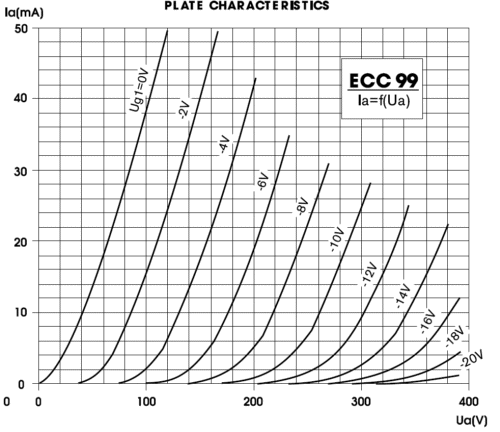 Since the ECC99's plate resistance is about 1/3 to 1/4 that of the 6SN7, we can get a much bigger plate-voltage swing from it. And since it offers a transconductance over three times greater, it will be much easier to drive to full output. Both types offer a 3.5W plate dissipation limit. Because our goal is huge output voltage swings, picking the optimal plate resistor value and idle current are crucial. 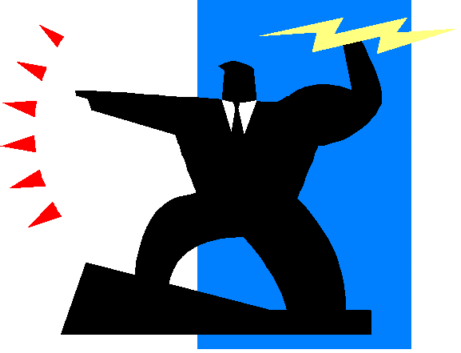 Let's start with the idle current. Electrostatic headphones are basically capacitors and it takes current to charge and discharge capacitance quickly. In fact, current against capacitance equals slew rate. I have build five or six electrostatic headphone amplifiers, all of which used an idle current flow of 5mA per triode. I would like to hear what twice that amount sounds like, so let's set the idle current per triode to 10mA. So far, we know the B+ voltage and the idle current. Next, we need to know how much voltage will lost across the triode is simple enough; we multiply twice the idle current against the rp, which is 2300 ohms for the ECC99; thus, 0.02 x 2300 = 46V. The next step is to subtract this voltage from the B+ voltage, leaving us with 494V. From this voltage we must further subtract the voltage lost across the cathode resistor, say 14V, bring us to 480V, which we then divide by 2 and then by the idle current, 10mA, resulting 24k as the optimal value for the plate resistor. Where Vb is the B+ voltage and Vk is the cathode voltage. Let's plug in the values. as the triode is configured as a grounded-grid amplifier. When we plug an rp of 2300 and a mu of 22 and plate resistor value of 24k, we end up with a gain of 21. Divide a peak voltage swing of 240V by 21 and you get the required gain from the OpAmp, namely, 11.4. This might prove more than we can actually get, however, from an OpAmp running off a single 24Vdc power supply. The workaround is to cross-couple the two triodes and two OpAmps. Now, we need only half as much gain from the OpAmps, about 5.7, which we can round up to 6. Once again, the cathode resistor does not provide all the current flow into the triode, so the OpAmp will have to source the difference. The 11.34v cathode voltage was found in SPICE simulations. One danger we might encounter is singing capacitors. The first time I heard a singing capacitor was in a tube tuner. It wasn't attached to an amplifier, yet I could hear music coming from one ceramic disk capacitor. The second time I heard singing capacitors was in an electrostatic headphone amplifier. The coupling capacitors were not cheap, being expensive, high-quality Wima foil and film capacitors. Nonetheless, they sang. The solution was found in using a different output coupling capacitor. I would use 1kV 0.1uF capacitor throughout. Making a high-voltage power supply for this electrostatic headphone amplifier is easy enough, as 800Vac center-tap power transformers are common. Another possibility is to use a full-wave bridge voltage doubler power supply. A 230Vac or 240Vac secondary is needed. Note the high capacitance of the reservoir capacitors. Well, these two 330uF capacitor effectively become a single 165uF capacitance. Still, that is a lot of capacitance. An RC filter drops the over 600V of raw DC voltage down to 540Vdc. The OpAmp and heaters share the same regulated 24Vdc power supply. An LM317 is used, as most LDO positive three-pin regulators present a maximum input voltage of 30Vdc. One great advantage to using a mono-polar power supply is that most OpAmp offer far worse PSRR from their negative power-supply pin. As this pin is directly grounded, we need only worry about the positive power-supply pin's PSRR, which is usually quite good. Another possible use for the hybrid gain stage whose OpAmp drives a grounded-grid amplifier is as the front-end of a single-ended power amplifier. The 300B is certainly a great triode, but it isn't easy to drive, due to its low-mu and weak transconductance. Just supplying a cathode resistor to cathode bias the tube can be an ordeal, as cathode voltages of 60V to 80V are common. Moreover, its grid will require huge, but clean voltage swings to achieve full power output. A quick calculation is that the grid will need to see a voltage swing near its cathode voltage. For example, if the cathode bias voltage is 70V, then we can expect needed grid voltage swings of +/-70v. Assuming an input signal of 1Vpk, the amplifier's front-end must supply a gain of 70. This amount of gain, then, is our goal. We have retained the OpAmp driving the driver triode directly, but not let the OpAmp control the driver triode's output. In other words, the OpAmp's negative feedback loop extends only to its output, not the driver triode's plate. The driver triode is configured as a grounded-grid amplifier and a 12AU7 or 6C4 triode is used. The Aikido action is more subtle this time, as our goal is not to produce a power-supply noise null at the driver triode's plate, but to ensure that the 300B's current conduction does not respond to the B+ voltage ripple. If the output tube's current flow is independent of the power-supply noise, then the noise will be invisible to the output transformer's primary and, by extension, its secondary. This is accomplished feeding the output triode's grid an inversion of the power-supply noise in an amount equal to 1/mu, where the amplification factor belongs to the output triode. A triode's grid is mu times more effective in controlling the current flow through the triode than the its plate is; thus, we must deliver 1/mu as much inverted plate signal to the grid to undo the change in current that the plate signal would otherwise induce. I warned you that it was subtle. Note that the 300B must be warm and conducting before the OpAmp gets its power-supply voltage of 24Vdc. Also note that this voltage comes from the current flowing into the 24V zener diode. If we ran two 300B tubes in parallel and if we used two 75mA constant-current sources, we could get a free DC 12.6Vdc power supply for the 12AU7. While listening to jazz albums on Tidal, an ablum titled, A Day In The Life Impressions of Pepper, caught my ear, especially the last song, a cover of The Beatles song, A Day in the Life, by The JuJu Exchange. I searched for albums by them and I found thier album, Exchange. This is not your father's jazz, being more like your son's jazz. Check out the article on the JuJu Exchange at www.vinylmeplease.com, as it explains far better than I can what they are all about. Definitely a new direction, an interesting direction at that. Any jazz album put out by the ECM label is worth hearing, as far as I am concerned. If you want to show off your stereo system, be sure to give Norwegian jazzman, Mats Eilertsen and his trio latest album, And Then Comes The Night, a loud listen, as it is beautifully recorded and it offers all sorts of percussive delights. His older album, Rubicon, is also worth checking out. If you have been reading my posts, you know that my lifetime goal is reaching post number one thousand. I have 545 more to go. My second goal is to gather 1,000 patrons. I have 925 patrons to go. Help me get there.